This entry is being written on the same keyboard, at the same desk, but in a different room of a new home. As such, the wish expressed in the last post has come true, and I am gradually settling into the new place. The move went reasonably well, but not without hiccups and not without lots of sweat, for we picked the hottest weekend so far this summer to lift boxes. Still, it could have been worse: By avoiding the province-wide moving day of July 1st, we saved the extortionate surcharges moving companies add on "D-Day". As it happened, the three Russians hired to manhandle my furniture did an excellent and speedy job. Sadly, the same could not be said for the Latino cleaners we had also booked for the day to remove the previous tenants' grime and the inevitable dirt from movers, electricians, cabinet builders and other assorted craftsmen that had worked in our new home in the preceeding days. On that sunny Saturday in late June, the cleaners simply no-showed on us (some would say that disappearances without a trace are a Latin American speciality), leaving us very exhausted at the end of a long day, in a dirty house, and unwilling to start stow away our belongings in filthy cabinets. Instead, we spent the next day moving more surplus stuff into boxes, and transporting these to charitable institutions and garage sales. At the same time, we scrambled to find alternative cleaners. Word-of-mouth eventually led to an energetic woman, who showed up on Monday morning to assess the work, and promised that her team would move in later that day. Imagine my reaction, then, when I got a text message around 17.30 saying that the cleaners were stuck in traffic and were not going to make it. As the next best available date, they suggested July 11 - today. It would have been unthinkable to live in such a mess for that long, and so we eventually resorted to a shady cleaning business from the online classifieds. They did a mediocre job on Wednesday, and insisted in cash payment - but they got it done. 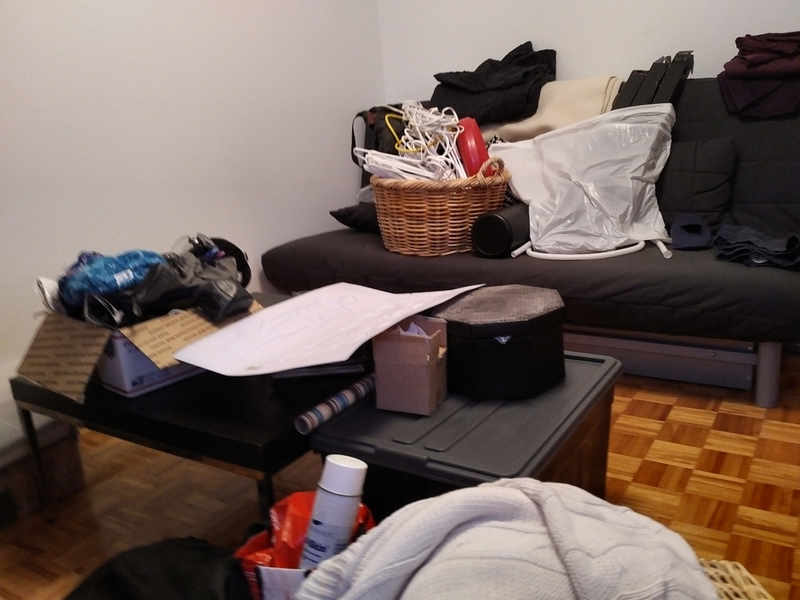 And with that, we were able to finally start "moving in" for real: Deciding what things go where, finding storage spaces, filling wardrobe and fridge, and cooking meals without disgust. The job is not done yet. In the two weeks since, we have relentlessly ticked of one after the other of the many smaller items still on the to-do list. Yesterday, the last Scandinavian flat-packs were transformed into furniture. Most of the boxes have been consigned to recycling. Lamps have been hanged, with curtains not far behind. The fight for bathroom shelf-space has ended in a draw. To the author of these lines, with a perfectionist streak and two left hands, it was not a fun time. Nerves have been frayed, backs hurt, and far too much of a short summer spent with a frown on the face. But as we slowly settle in, so does a new routine. The sweat and treasure (no blood, fortunately) were an investment, then, and it already starts paying dividends: A few days ago, we enjoyed our first dinner in the finished dining room - an important waypoint on the journey from a new house to a new home. It is a new chapter. It will require adjustment, nimbleness, and compromise. We are keen, and by now we are well rehearsed... in thinking outside the box.